SHENZHOU 7: China's Shenzhou 7 spacecraft is about to reenter Earth's atmosphere, probably over a remote area of the Pacific Ocean: map. The nominal reentry time is 04:05:00 GMT +/- 6 Hours on Jan. 4th. On Sept. 25, 2008, Shenzhou 7 carried three taikonauts to Earth orbit. The taikonauts parachuted to Earth on Sept. 28, 2008, in a descent capsule, leaving the SZ-7 mothership in a decaying orbit. Check the Simple Satellite Tracker to see if you are favored with a final flyby. It will be interesting to see if a disembodied tail emerges from behind the coronagraph's occulting disk in the hours ahead. This kamikaze comet is probably a member of the Kreutz sungrazer family. Named after a 19th century German astronomer who studied them in detail, Kreutz sungrazers are fragments from the breakup of a giant comet at least 2000 years ago. Several of these fragments pass by the sun and disintegrate every day. Most are too small to see. Today's fragment is a big exception. Credit: The comet was found on Jan. 2nd by Australian amateur astronomer Alan Watson, who was inspecting images obtained by STEREO-A's Heliospheric Imager on Dec. 30, 2009. SOLAR ACTIVITY: Sunspot 1039 has stopped growing, but it is still putting on a good show. 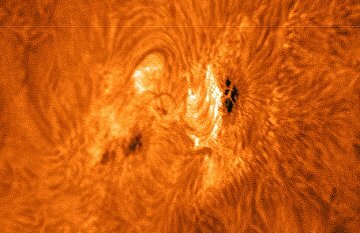 The sunspot's dark cores are sitting inside a swirling, churning tangle of magnetic filaments, frozen here in a Jan. 3rd snapshot from Rogerio Marcon of Campinas, Brasil. "This is a very photogenic sunspot," says Marcon. The sunspot is approaching the sun's western limb, where it will disappear from view on Jan. 5th. readers with solar telescopes, catch it before it goes. On January 3, 2010 there were 1091 potentially hazardous asteroids.